I’m guessing this might be Mum, Dad and Daughter, on holiday in Margate, and set for a visit to the Marine Bathing complex in one, and just out for a stroll in the other (with Box Brownie in tow). These parasols crop up in a few walkies and seem to have been a popular mid-Twenties trend . The portraits were taken with a day or so of each other (the reference numbers are 113 apart) by a photographer working for Fotosnaps, run by Remington, and taken in the Westonville part of the promenade. That looks like their kiosk in the background of the card above. We know this must be pre-1928 as Remington moved to Paignton after that, while both cards have the firm’s older backprint on suggesting it is from the early twenties. The cards are a little over-exposed, but it may be because the darkroom worker has held the process back to retain the details in the face. There is more on the story of Remington’s on the site and in the book Go Home On A Postcard. I have printed a few walkies taken on Blackpool Central Pier before. This is another, taken on a regular walking picture spot. It was so popular people often formed a small queue at bust times. It has been dated 1945 on the back by one of the two ladies, we seem to be enjoying themselves, but otherwise we do not know who they area. The photo was found and scanned by Brian Partridge. We do know the pier had a V2 Rocket on display for a couple of years after World War 2, and the awning for this attraction can be seen in the background. You can see some similar images on the site. A Blackpool walking picture from 1944 has also recently turned up which suggests the trade continued during the war although this is quite unusual. 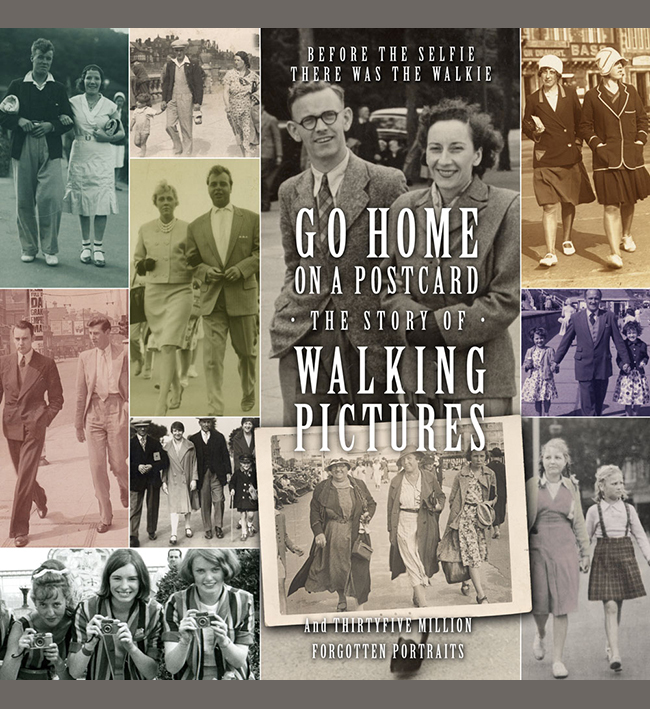 Walking pictures from 1944 in Hungary and 1943 in Belgium have also been seen, and I will try and get these on the site at some stage. This walking picture is a long way technically from being a great photograph but it captures a tiny moment in time so well; two young women with a new baby out walking with their pram on a blustery day, you would think it was just taken by a friend – except it has the giveaway print reference number on the back. One of the women has written their home address on the back, 3 Howgill Cottages, Low Road. This is a rural road in Brigham outside Workington in Cumbria, but I cannot locate the house. Not do we know for sure where it was taken, though one of the North West resorts seems likely, perhaps Morecambe (could that be the Midland Hotel – 1933 – going up in the distance?). Despite the poor print, what seems to be double exposure, chemical marks and the lack of detail (it’s only 2″ by 3″ but may have been one of a pair), they clearly enjoyed having it taken and bought the print as a souvenir of the day. These two cheerful looking ladies clearly went on holiday together quite frequently judging from a small pile of walkies I found at a market stall recently, probably from a house clearance. Although they are seen with a small child in some (and perhaps grandchildren in others) and husbands, mostly they were photographed together by the walkie cameraman. The majority of the walkies were taken in Skegness after the War, and one in Margate in the Fifties (when the lady on the left seems to be on her own more) but these two sets here I cannot identify, although I do have others taken on the same spot, so it would be good if anyone does know where it is. Theses walkies were of the type taken on a converted movie camera and sold as a strip of three, but they were cut into individual frames later by the owners and one is missing from each. I think they were probably taken on the same holiday (judging by the tree in the background which hasn’t changed! ), and the lady on the right has a very sharp imitation snake skin pattern handbag in both sets. The rough frame edge of the enlarger is also identical on the final frame in both cases. It seems a popular spot, with people perhaps coming up a slight hidden incline in the background to the seafront from town, and you can see half a dozen people in the background in the scene below waiting their turn to walk toward the camera. The fabulous art deco pier at Worthing has escaped the neglect (or worse) suffered by many similar structures around our coast. The buildings have all been restored and the partition which runs down the pier has been adapted to make a great outdoor display area. The local arts group Creative Waves works hard to use this and the entire seafront area to put a new project together each summer. It looks like a model of how to make use of a great resource and help bring people back for a visit. For 2016 one of the focus points was the seaside postcard, and they asked Go Home On A Postcard to co-operate by sending some of the walking pictures taken in Worthing to use as part of this, which we were happy to do. Worthing was an outpost of the multi-franchised Sunny Snaps walking picture empire, and there were a number to choose from. One of my favourites is shown above, you can read more about the image on our site. There are all sorts of displays and related art works going on around the pier, including some new takes on those head in a hole boards for people to pose with (they are great to do, but it’s hard to decide exactly what to feature in these more PC times -paintings of knock-kneed Scotsmen or bosomy women in ill-fitting bathing costumes are not likely to get past the local authority these days!). From this distance (238.2 miles!) it’s a little confusing to work out exactly what’s going on from the Creative Waves website, and they have not sent me any photographs of how the images have been used (so the image above is from an older display), but if I leave it any longer to mention it may all be over! And if you’re in the area it’s a day at the seaside, so what’s not to like?